Jivitputrika Vrat Katha, or Jitiya Fasting story, is listened to by all mothers observing Jivitputrika fast. The fasting is observed women in Bihar, Jharkhand, parts of Uttar Pradesh and Madhya Pradesh for the welfare of their children. There lived a famous king in Satya Yuga named Jimutavahana. The King was famous for his honesty and good rule. He also was ready to go to any extent to protect his citizens. Once while the King was at the home of his wife’s parents he heard the cry of an old woman. Jimutavahana soon approached the old woman and found out that she was crying as her son was killed and eaten by Garuda, the Vahana of Lord Vishnu. Jimutavahana promised the old woman that he will get back her son. Soon Jimutavahana approached Garuda on a mountain. The king saw skeletons of human beings lying in a big pit. The bones were of all the people that Garuda had killed and eaten. Garuda soon noticed Jimutavahana and wanted to know why he was there? The King demanded that he return the son of the old woman and instead he can eat him. 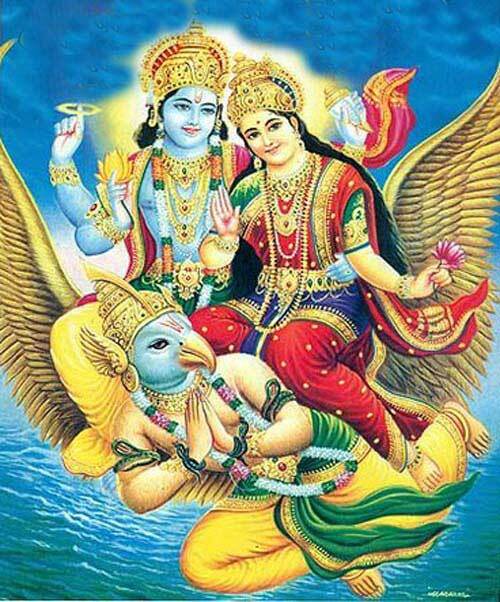 Garuda agreed and began to eat Jimutavahana. But soon Garuda stopped and wanted to know why he was sacrificing himself for an ordinary person. Jimutavahana replied that no child is ordinary for a mother. I am sacrificing myself so that an old mother will get back her only child. No mother can bear the loss of her child and there is no greater unhappiness than losing a child. Garuda soon realized that the man before him was no ordinary person and wanted to know his identity. Jimutavahana introduced himself and said not to look his status. Asked Garuda to kill and eat him so that the old woman will get back her son. Soon Garuda stopped eating Jimutavahana and was pleased by generosity and empathy displayed by the King and offered him a boon. As boon - the king asked for the life of all the people that Garuda had killed and had eaten.